Is there anyway to do a terrific mockup of making a forest? Texturing isn't a problem, so I could make transparent textures or anything else I might need. I have flats and bark textures for it too. 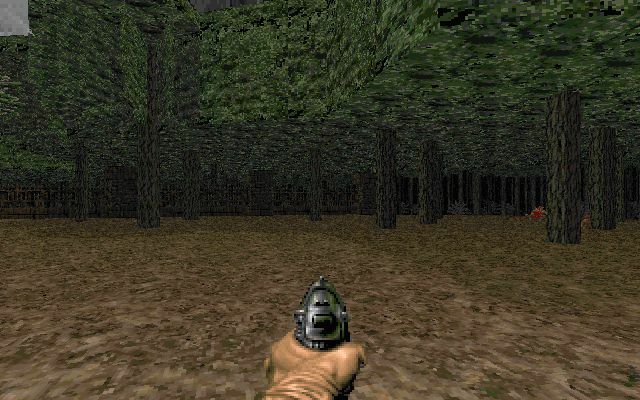 SQ2.wad, in the Doom megawads section, has an excellent forest level (or two). Just change the perimeter to something cooler. I give up. I don't even know if that's sarcasm anymore. On the trunks of some of the trees, I thought about making some limbs stick out (by using transparent textures) and probably adding a bit depth to the trunk (like some insets or depressions) so they don't look like big cylinders. I once made a forest of Mordeth-style trees. Lagged. As you can see from these screenies, I find it best to do sector-based trees combined with sprite trees and one treeline texture to go round the outside of the forest. I once made a forest like that, too. Didn't lag. Got stolen. Anyway, the trick is to build a good -perimeter-, with only a small layer of actual sector-based trees. At the edges (or at clearings) you add more detail, like linedef-based branches. Inside the forest, you add shading (2, maybe 3 shades is usually enough) and small height difference. Always place trunks at the corners of these height differences, and maybe a few linedef-based branches. This makes a quite good illusion of stems reaching up through the leavy ceiling. Never fill in entire surfaces with trunks, but make 'winding paths' instead, with the occasional bigger patches punctuated with clearings. As a finishing touch, add sprite-based decorations such as ferns, and do play around with sunken flats now and then. The jungle in Twilight warrioir was good. Yes. It used a sector as a trunk, and a sprite-based crown on top of this sector to make a convincing palm tree. However, you won't be able to make a good dense forest with just that. Excellent examples of forest can be found in the build-based game Nam (shareware available as well, on happypuppy perhaps?). Sector-based jungle, with sprites here and there when more detail was needed. Of course, build has the advantage of slopes. Hacx has a couple, IIRC. Also there's a level soon to be released (which I helped playtest) which has two tree sprites. In Cyb's picture... what port is that? Excellent examples of forest can be found in the build-based game Nam (shareware available as well, on happypuppy perhaps?). I *think* the shareware version is actually known as "Platoon - Total Conversion" by the TNT team. Note this is not team TNT authors of Boom etc. The TNT people from the Platoon TC (which became the NAM game) have undergone a name change and still run a site and do stuff with newer game engines. 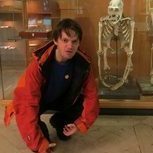 Someone around here gave me a link, but I don't have it handy ATM. Mordeth: What level on your TC has some good examples of the forests you have done? The Sonic ones look kool, but from what little I can gather from your pictures, yours looks more realistic. Really? Is that a ZDoom-only level then? That quote... you wouldn't see something like that in a vanilla wad. Thanks! :) The linked picture was from a level of the yet unreleased episode 3. I also had a forest-only level, but without backup that one was lost due to a burglary. 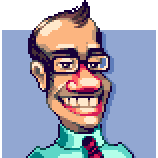 BTW, Joe Zona made the actual textures for me with a few modifications from my part afterwards. Note that the forest is actually undecorated yet... fern sprites and so on are still missing. 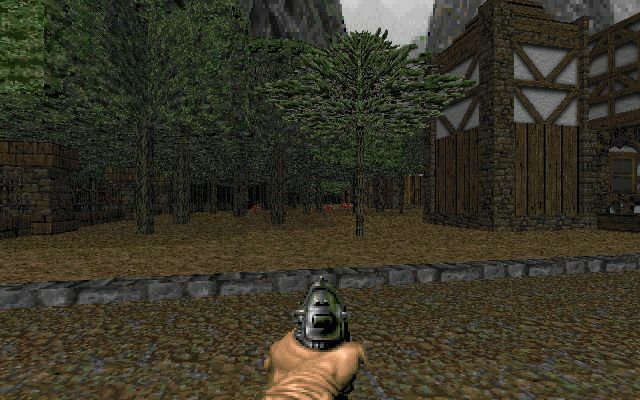 yeah, those sure are some attractive doom trees! :) sure that forest will look a good deal nicer once it's finished too. Thankx for the extra pics, I REALLY wish I could take a walk through there and have a look, that looks great! The problem with a lot of DOOM levels out there is the lack of realism. I guess that does not take away from the game play, as many of the hokey looking ones play really well, and have great level design, but crappy textures, and generic looking sceens really degrade the whole effect quite a bit. Just look at all of the Starwars conversions out there, all of them look horrible with the exception of Darkest Hour. The problem with a lot of DOOM levels out there is the lack of realism. Heh, sorry, that was pretty funny. No what I ment was the qulity of the textures. 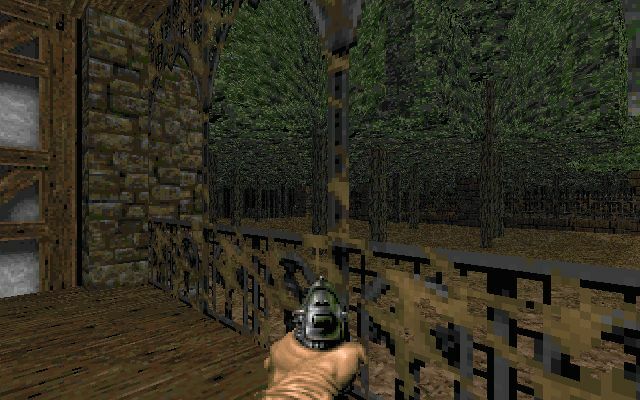 Look at Mordeth for example, it looks amazingly good as does the Quake TC that used to float around the net. Damnit, Mordeth, finish Mordeth damnit! Too many damn shotgun guys, I thought...what did you think about the attempted realism? Cause you're not the only one who enjoys seeing realistic things in doom levels.